Spring and summer is the time to harvest green beans, cucumbers, tomatoes, peppers, and many other veggies. The bounty in these two seasons is the reason for gardening, in my opinion. It’s the time when we are blessed with the tastiest of fruits of our labor. These tips for harvesting vegetables will give you the information you need to harvest at the right times in the season. When it comes to harvesting vegetables, it seems like it’s sometimes a mystery as to when certain ones are ready to be plucked from the plant or vine. Sometimes, fruits and vegetables are harvested too early and haven’t fully developed on the plant, causing the flavor and texture to be less than it should be. Other times, we harvest late and the bugs and birds take advantage of the soft flesh of our ripening fruit. 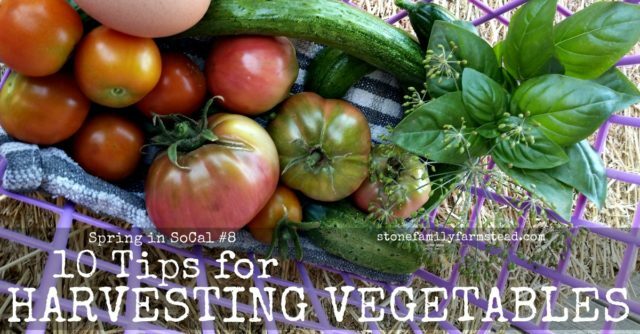 Try these 10 tips for harvesting vegetables and stop guessing when the time is right! It just occurred to me that I have never really formally researched how to harvest vegetables. I’ve been picking them off my vines and plants for years, but I’m not always sure how to tell when is the best harvesting time for all of the veggies I grow. Since I’m closing up the Spring in SoCal series this week, and because I have a few veggies in the garden to harvest, I thought it would be cool to gather the information for myself this year, and post it in a compact fashion so that you and I could return to it later on as needed. Tomatoes (49-90 days) are ready to be harvested when they are mostly red with perhaps a small amount of yellow at the top, unless you are growing yellow or orange varieties, and in that case you would wait until they are all that color. They should feel firm, but not hard, when harvesting. Allowing tomatoes to ripen on the vine is preferable, but if you must harvest early or before they are finished ripening, put them in a paper bag and store in a cool, dry place. Cucumbers (50-70 days) are usually better harvested small, which can be different depending on the variety. Pickling cucumbers are best harvested between 2-6 inches, while larger varieties can be harvested early or later, between 2 and 8 inches long. They should be firm, not soft or wrinkled anywhere on the fruit, and bright green (pickling) or dark green (larger varieties). Zucchini (45-55 days) is also one that is great when harvested smaller in size, no longer than 6 inches. This is when they are the most tender and flavorful. If they get really big, they lose that tenderness and flavor and aren’t good for much more than collecting seed. To harvest, cut the stem with a small knife, or if you can manage it, you can break the stem. Sometimes, if you choose to break the stem, the fruit will break instead, so I recommend using a small knife or garden scissor of some kind to cut it. Green beans (50-60 days) are best harvested smaller, before the beans inside the pod are defined enough to see. That means you’ll want to harvest when they are 3-6″ long (depending on variety), and when they are smooth, green (unless it’s a different colored bean, like yellow or purple), and not lumpy or wrinkly at all. Green beans usually grow in pairs, but pick them singularly if only one is the right size. They should come off relatively easily, but if not, you can hold the stem with your other hand and pull the bean off. Carrots (70-80 days) are harvested when their green leaves and foliage are 8-10 inches long, and the carrot top looks thick. Carrots will grow smaller if they are planted close together. To harvest, carefully stick a shovel or garden fork into the soil, being careful not to damage the carrots, and loosen the dirt to prevent breakage. Radish (22-70 days) are harvested when the top of the fruit/root is round, about an inch in diameter (depending on variety) and poking out of the soil. Loosen soil around the radishes for easy harvesting. Kale (60 days) is harvested as young leaves from the bottom of the plant about 2 months after planting. It can be harvested from for many months in this way and can survive heat and cold. Green Onions (20-30 days) are harvested when their stalks are 6-8 inches tall, and the bulb has begun to swell. Use a garden shovel to gently loosen soil, then remove the onions. Potatoes (75-90 days) are harvested 2-3 weeks after the plant dies back. Use a garden fork to gently loosen the soil, then remove the potatoes. Sweet potato (90-170 days) are harvested when the leaves and ends of vines start turning yellow, but they can be left in the ground until the first frost. Use a garden fork to gently loosen the soil, then remove the potatoes. These tips for harvesting vegetables are just a general overview of what gardeners need to know about harvesting spring and summer veggies. For more in-depth information, I recommend The Vegetable Gardener’s Bible by Edward C. Smith. It’s a book I’ve referred to for almost 10 years for the great information it contains. If I may make another recommendation, The Gardening Notebook by Angi Schneider is a great way to keep track of garden information year after year. I highly recommend it.